Founded in 2008, the Outstanding Brewing Company is an independent craft brewery that produces standard and bespoke cask real ales, beers, stout and lagers using a combination of traditional brewing techniques and cutting-edge technology. Based originally in Bury, the re-location to larger premises in Salford has allowed the company to fulfil its sales expansion targets through investment in plant equipment upgrades – a major project to increase beer output volume while maintaining the stringent product character and qualities that are demanded by its increasingly discriminating customers. 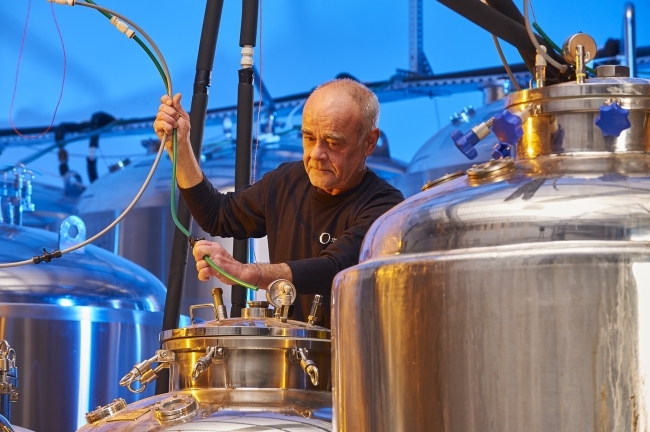 In keeping with the brewery industry at large, the Outstanding Brewing Company has to rely on a continuous supply of compressed air and nitrogen as a critical element at every stage of the production process: right from purging kegs and tanks, oxygenating beer to promote fermentation, right through to filling, bottling, labelling and packaging the final product. It became evident to the company that its existing rented equipment would be unable to cope reliably with required new volume targets or, for that matter, provide opportunities for future growth. The company’s management therefore saw the investment in a new state-of-the-art system as the best option. 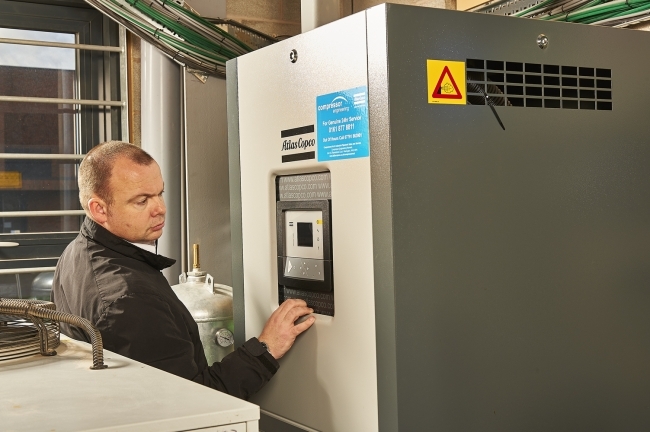 As a result, they turned to Atlas Copco to install units that would not only meet its process needs but also provide opportunities to realise operational cost savings, in terms of energy requirement, and a comparatively short-term payback on capital costs. Not only is compressed air essential for flushing the company’s brewing tanks, bottle filling and labelling. It also plays a direct role in the nitrogen supply and in the brewing process itself, such as aerating the wort – the malt infusion that is fermented to make the beer. To meet all these needs, Atlas Copco installed a system comprising a tank-mounted 5.5 kW GX5 rotary screw compressor. The energy-efficient compressor’s dry air output feeds a plug-and-play NGP8+ nitrogen generator and buffer tank, then a separate storage receiver for nitrogen at the required purity. The NGP+ generator’s innovative working principle is based on Pressure Swing Absorption (PSA) technology. Carbon molecular sieves isolate nitrogen molecules from the compressed air while oxygen, CO2, water vapour and other gases are adsorbed. The result is a guaranteed and continuous supply of nitrogen at the highest purity levels of up to 99.999 per cent. This is utilised for purging the casks, kegs and tanks and gassing certain products. The NGP+ generator is fully automated and monitored, with an oxygen sensor as standard. A special off-spec check feature means that nitrogen with a purity that is under the specified threshold cannot reach the sensitive process application. In this instance the NGP+ would recycle the nitrogen to the buffer tank until the required purity is attained. The condition of the feed air being supplied by the compressor is also continuously monitored. When it doesn’t match the generator’s requirements, the feed air is blown off before it can enter the nitrogen generator and an alert indicator is raised for the operator to investigate. He added, “In order to achieve the desired level of carbonation in differing beer styles we have adopted a number of techniques including natural and induced high pressure, aided by the Atlas Copco equipment.” As a further example, in response to customer demand they undertook considerable R&D to introduce a keg stout with the distinctive nitrogen cascade pour style associated with other types of beer. 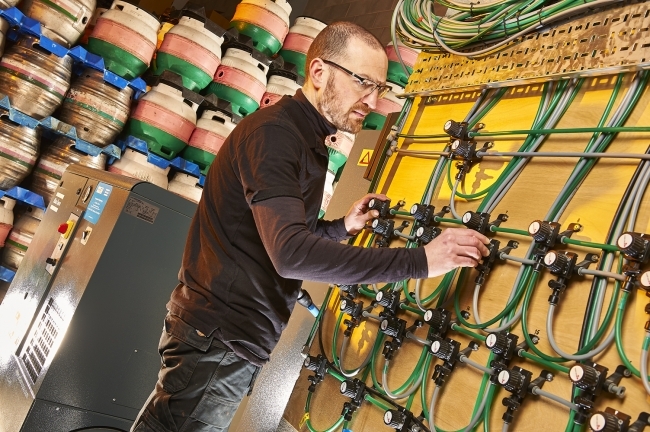 As with other progressive brewery managers, Alex Lord realises the advantages of using on-site nitrogen generation in comparison to a delivered nitrogen bottle or liquid nitrogen service. Taking into account fuel costs and carbon emissions associated with truck delivery, wastage from on-site liquid storage and conversion to gas, plus rental fees and hazmat charges, point of use nitrogen generators tick all the right boxes.